Researchers at the University of Bath are using a pioneering technique to study the properties and characteristics of our skin, in tests that could pave the way for new treatments for dermatitis, and for an improved understanding of the skin aging process. Using a minute "nano-needle" in conjunction with atomic force microscopy (AFM), scientists are studying the structure of the thin top layer of our skin, known as the stratum corneum, in the first tests of its kind. This layer of the epidermis, typically between one-tenth and one-fifth the thickness of a sheet of paper (0.01-0.02 mm), forms the barrier that keeps water inside our bodies and microbes out. Skin scientists have long been interested in how the stratum corneum achieves this feat while maintaining its remarkable strength and elasticity. In a new paper, published in the top-ranked Journal of Investigative Dermatology, recent Ph.D. graduate James Beard, Dr Sergey Gordeev and Professor Richard Guy demonstrate the nano-needle’s ability to probe corneocytes – the predominant cell type in the epidermis of the skin. 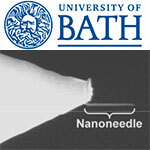 Until this new research from Bath, it was only possible to examine the surface of the corneocyte with AFM. Now, thanks to the novel nano-needle technology, researchers can shine a light on the cell structure deep below the surface. By examining stratum corneum samples from human volunteers, a clear difference has been demonstrated between the softer, external layer of the corneocyte and more a rigid, internal structure. The nano-needle enables a mechanical scan (so-called tomography) of the skin cell to be performed, offering the potential to detect structural and biomechanical changes caused, for example, by environmental factors, ageing or skin disease. As Dr Sergey Gordeev, from the University’s Department of Physics, explains: “ AFM enables us to image samples by tapping them with a sharp probe – essentially in the same way that blind people get information about the shape of an object by touching them with their fingers. But up until now we’ve only been able to use this technique to study the surface properties of materials.By constructing a nano-needle at the tip of an AFM probe we’ve extended our imaging capabilities into the third dimension. We strongly believe that this new technique will find many interesting applications in biology, nano medicine and material science ." Profe s sor Richard Guy , Department of Pharmacy & Pharmacology, added: " A deeper understanding of the biomechanics of skin barrier function, and the relationships between this role and the physical properties of human skin cells, may lead to the development of new therapeutic or cosmetic products to restore or reinforce the skin. This would benefit, for example, individuals with dry or eczema-prone skin and, perhaps, the ever-increasing ageing population whose skin becomes progressively fragile over time. "